I did not know the proper name for the odd coloration for this condition until I read today's previous post. My wife's caught this photo of a Mule deer with the leucistic anomaly. She captured this photo and several others April 28, 2016 while we were visiting in Canyonlands NP, in Utah. Her 60d camera had just run out of battery, so I swapped the one from my 5d3, thus she got the shot while I just watched. We later mentioned to ranger that we'd seen the deer, and was informed it had been hanging in the area for several weeks and wasn't spooky, so wife's shot was at a lot less than half mile, more like 75 yards. Canon 60d, 70-300L@ 300, 1/400s., f8, ISO 400. Picassa - some crop and resizing. I did not know the proper name for the odd coloration for this condition until I read today's previous post. My wife's caught this photo of a Mule deer with the leucistic anomaly. 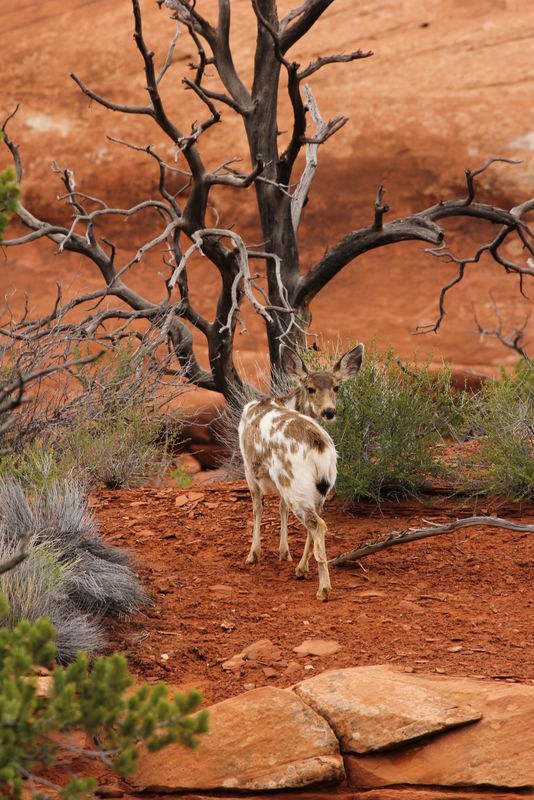 She captured this photo and several others April 28, 2026 while we were visiting in Canyonlands NP, in Utah. Her 60d camera had just run out of battery, so I swapped the one from my 5d3, thus she got the shot while I just watched. We later mentioned to ranger that we'd seen the deer, and was informed it had been hanging in the area for several weeks and wasn't spooky, so wife's shot was at a lot less than half mile, more like 75 yards. Lovely, I like the gnarly tree, too. I learned a new word today! Nice picture too! thanks photophile, yeah, the area is a literal jungle of photogenic dead trees. Thanks for the comments Basil , my byword is, 'never stop learning'. Very unique and a beautiful shot, also wonderful composition!! Thanks for the nice comment angela, and my wife thanks you. Thnks for your comments OldWolf, I had assumed that it was a color variant of an albino, but apparently not. Thanks for the thumbs-up jaymatt. Thanks Swamp-Cork. Good wife is a very good student, sometimes surpasses the teacher!! I like everything about this shot. I once got some shots of a leucistic wren, which probably didn't live a long life because of the coloring. I also like the tree in background.